When I was a wee lass, perhaps 5 or 6 years old, my family took us for a camping trip in the English country side. The English weather lived up to its good name. It rained the entire time and the field was muddy. Before long, my wonderful father suggested the brilliant idea of taking me to a nearby pub. I realize now that it was probably at the request of my Mother, to get me out of her hair so that she could get the tent set up. (Thanks Mum) However, at the time, I just thought my Dad wanted to take me on a great adventure. My memory of that pub is as keen as if I was there yesterday. The worn wooden bar top, darts and snooker tables, footy on the telly, and the stench of stale beer soaked carpets …. in other words….paradise! I was perched up on a tall bar stool and given a strongbow to sip. Oh what heavenly nectar, sweet as a hummingbird’s kiss! I was done with camping, this was what life was all about. It made an indelible mark on my young mind and since then, it’s been my lifelong dream to have my own private pub in my own house. The Bartender is in the house! 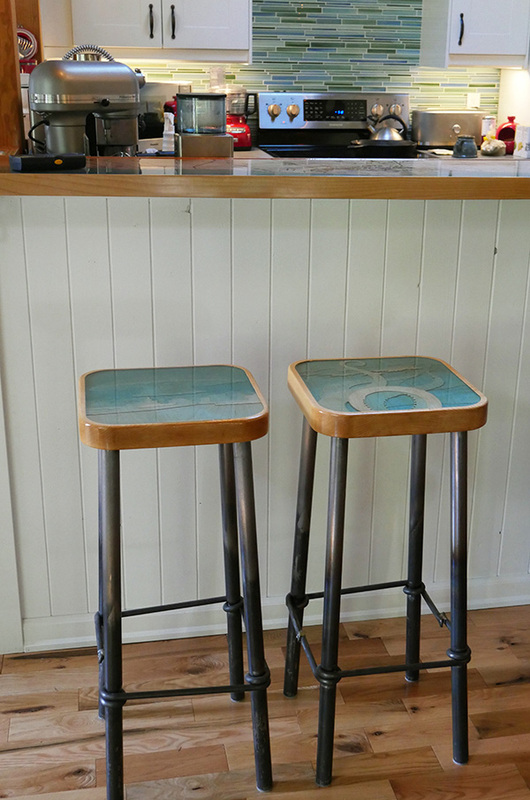 Our bar stools are shown here in progress. More about that project below. 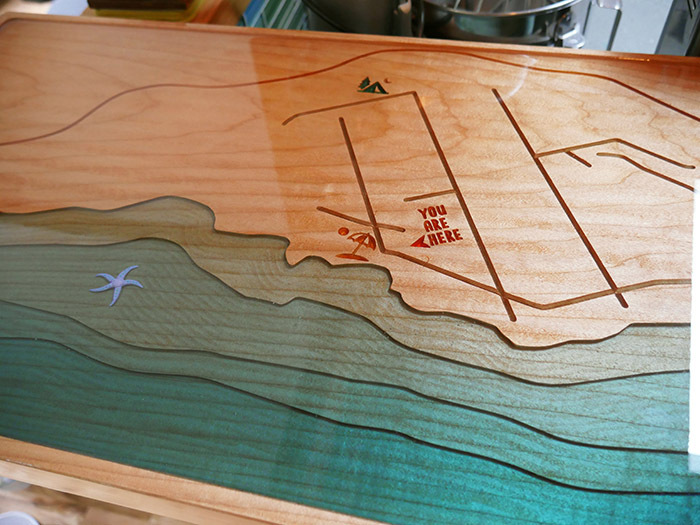 It includes a 9ft long custom maple bar top which has been in the works for a while. It started about 8 years ago when in Reimer hardwood I came across a 9 ft, 2 inch thick by 14 inch flawless slab of maple. I decided that one day it would be our bar top. We lugged it around for several years before we made it here. 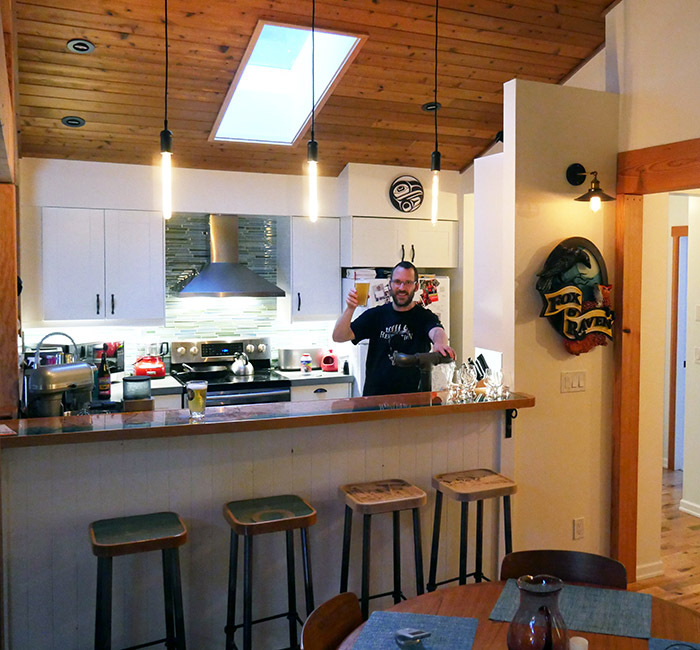 With the kitchen reno designed, we realized that the maple slab fit the bar area perfectly – almost like it was meant to be. 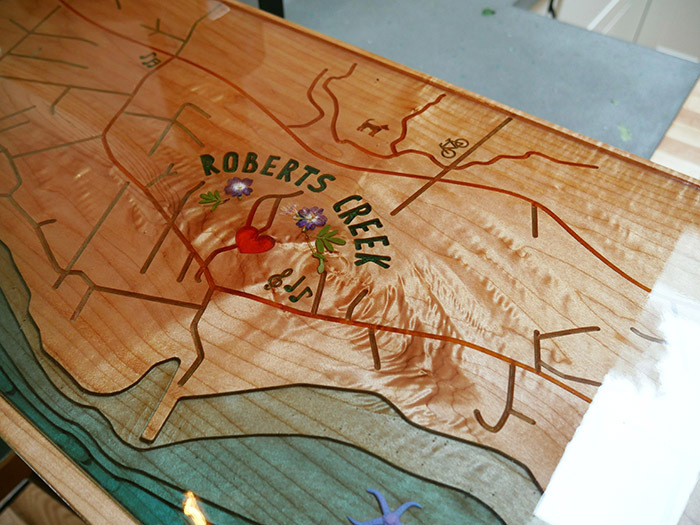 We cut the map of Roberts Creek into the surface with the CNC. 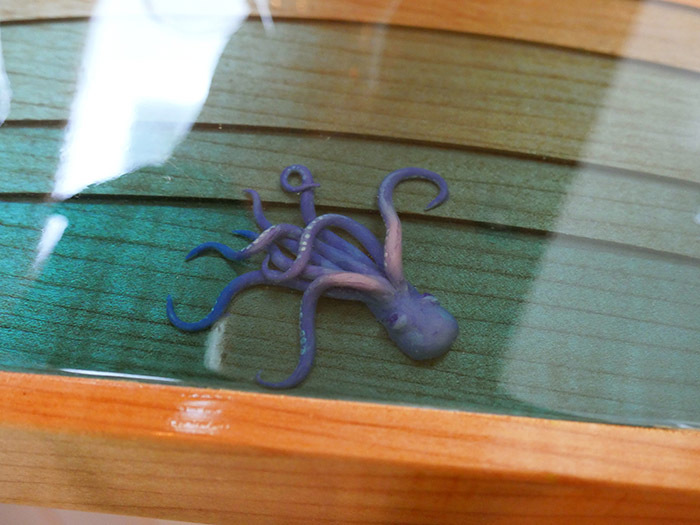 The top is made with tinted epoxy in about 8 pours – a tricky process. 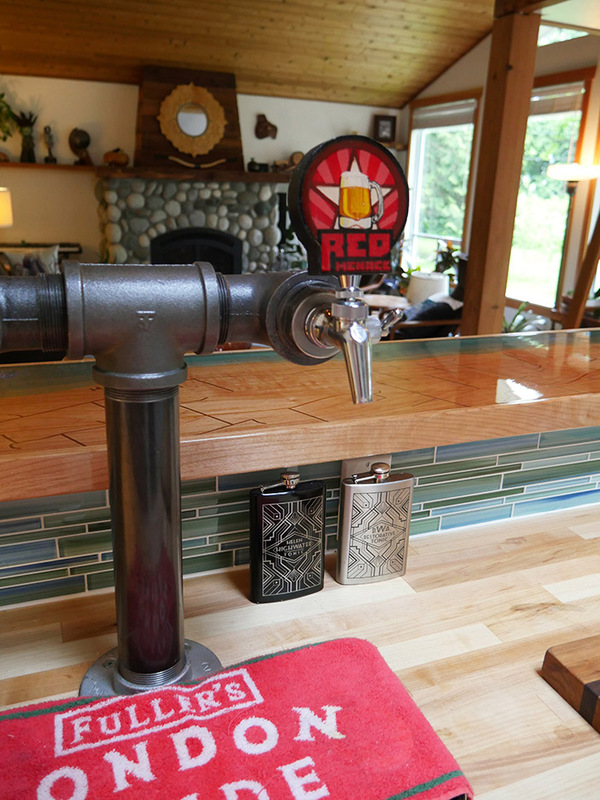 The beer taps are the next project. 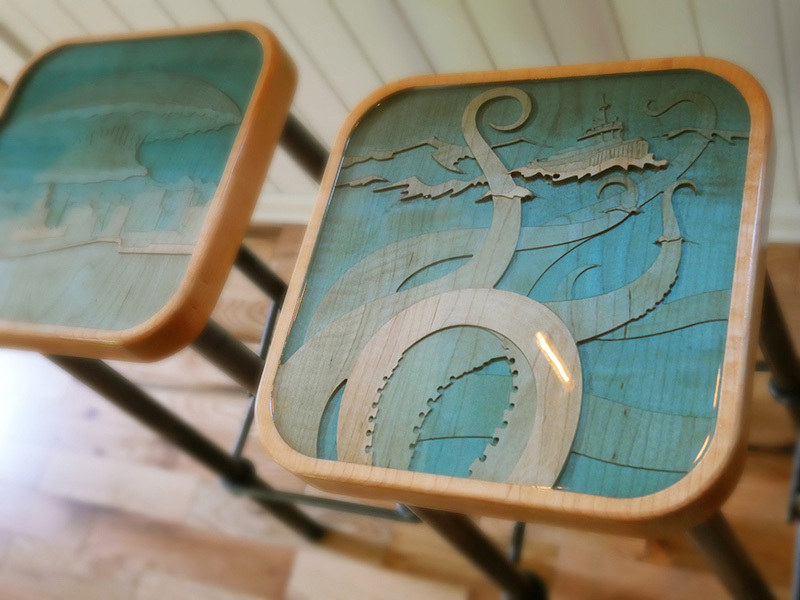 They will be cut from maple and walnut, one for each beer style.